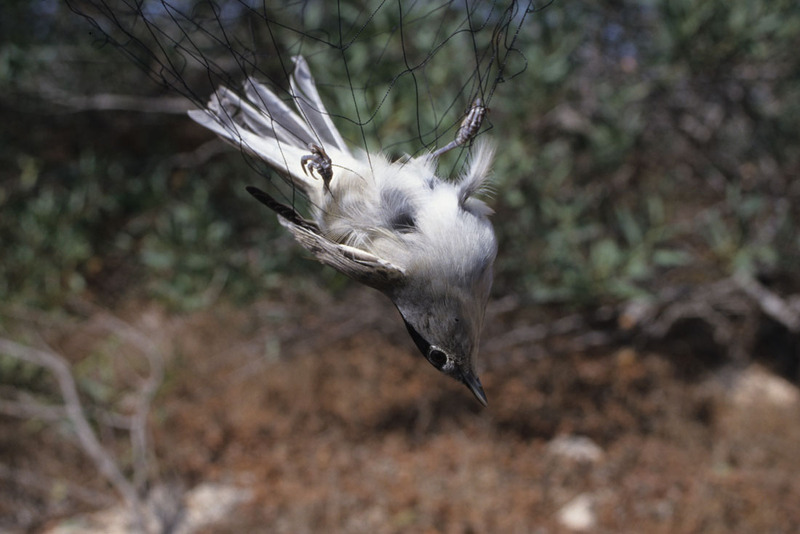 The illegal trapping and hunting of millions of birds around the Mediterranean has been well publicised in recent years. A 2015 BirdLife International scientific review, 'The Killing', estimated an annual death toll of around 25 million birds, with Italy and Egypt being the worst offenders. Also high on the list is Cyprus, where there is a huge problem with the illegal trapping of migrant birds for the expensive food delicacy ‘ambelopoulia’. The ‘traditional’, but illegal, limesticks are still in use for catching birds. However, it is the many kilometres of mist nets in conjunction with electronic bird calling devices playing birdsong which are the most sinister, forming a shroud of death for migrants birds moving across this island. This infographic provides a more information about illegal bird trapping in Cyprus. I have been out to Cyprus several times during the last 16 years in connection with this problem and unfortunately illegal trapping remains rampant on parts of the island. I helped set up the first survey on illegal trapping levels back in 2002, and since then there has been some tireless and dedicated work by BirdLife Cyprus, supported by a number of volunteers, to keep this difficult annual monitoring project going. This gives us a unique insight into the issue and allows the levels of trapping to be assessed over the last 15 years. The latest report from BirdLife Cyprus on trapping levels in autumn 2016 show how serious the problems still are. The report estimates that over 1.7 million birds could have been killed within the survey area, which covers the British Military Eastern Sovereign Base Area (ESBA) and parts of the Cyprus Republic areas, and nearly 2.3 million birds across the whole of Cyprus. The complex dynamics of the problem are depressingly fascinating. Organised crime gangs are involved in this illegal activity on a huge scale and it is estimated they earn millions of Euros every year. The driver for this illegal trade is the continuing demand for ambelopoulia from restaurants in the Cyprus Republic. Disturbingly there seems to be little or no political appetite to tackle this issue and enforcement against these law-breaking restaurants has been very limited in recent years. The European Commission has repeatedly called for Cypriot authorities to clamp-down on the illegal market and more action is desperately needed. Set against this, is the fact that some of very worst areas for illegal trapping are on the ESBA, particular on the Cape Pyla area. During the last 20 years trappers have illegally planted and irrigated large areas with a fast growing non-native acacia. These form the killing fields where the mist nets and calling devices are set. The latest report estimates over 800,000 birds were illegally killed on the ESBA last autumn. Furthermore, that Illegal trapping activity in 2016 remains at highest levels on British Territory since monitoring began in 2002, and at just over 180% of that baseline level. The small British Sovereign Base Area police have the difficult, and sometimes dangerous, job of trying to enforce the law as trappers from the Cyprus Republic flood the area each autumn. However, whilst the acacia, and the profits they ultimately deliver, remain in place then the trappers will persist. In late 2014, the SBA authorities started a program of clearing the acacia leading to the clearance 54 acres of acacia. Unfortunately, attempts in 2016 to continue this work resulted in significant local demonstrations from the pro-trapping community, with even Cypriot MPs apparently turning up to join in the protest. As a result, it was not safe for the contractors to operate and only 7 acres were cleared with over 90 acres still remaining. With scale of local feeling so high, the UK Government are going to have to commit further significant effort and resources to get the acacia removed from the landscape. Against this turbulent political backdrop, during last autumn a colleague and I went to work with the SBA Police to install covert video cameras at a number of trapping sites over a four week period. This was bit of an experiment to see if we could help gather evidence to improve enforcement work. Despite years of experience of this work in UK, we were a little anxious how things would go in a completely different type of terrain. However, with the help of the SBA police, things turned out very well and we recorded 18 individual trappers at a number of sites on Cape Pyla. Some of the footage was highly graphic with trappers casually cutting the throats of dozens of birds caught in their nets. Encouragingly, during the autumn the SBA police opened more criminal proceedings and confiscated more mist nets than ever previously recorded. As I write we wait for the cases we worked on to come to court – hopefully the footage obtained will encourage strong deterrent sentences. In addition to the mainstay of our work on Cape Pyla, we also did some work in a notorious trapping area in a remote hilly area west of Larnaka, within the Cyprus Republic. We did a recce one afternoon and noted significant trapping activity amongst the groves of trees in the valley below. Arriving in the dark on a moonless night we had the entertaining experience of driving in without headlights with my colleague hanging out the window to give me directions as we picked our way along a rough track. Once on site we had a difficult walk down a steep, rocky and thorny hillside to get into position covering two of the trapping areas. As dawn broke we filmed two trappers hard at work using mist nets and limesticks. In contrast to the trappers we had recorded on the ESBA, who despatched the birds with a knife, these two crushed the neck with a swift bite. The grisly nature of this can be seen on this video clip. In a couple of hours we estimated they collected around 200 birds, probably worth around 400 Euros. This evidence was passed to the Cypriot authorities and a few days later we heard the authorities had been back to the site and two men had been caught trapping and arrested, including one of the two men we had filmed. 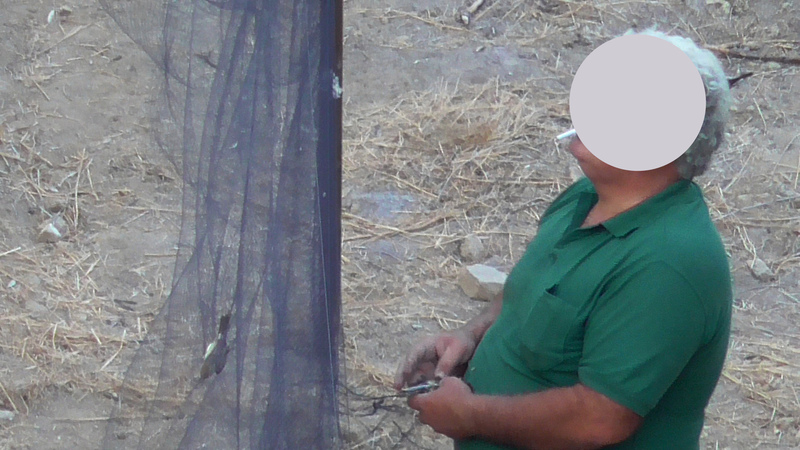 Only yesterday I learned the trapper in the photograph below had recently pleaded guilty at court to seven charges and fined 1,150 Euros - I doubt this will be much of a deterrent in light of the size of the bird trapping operation he was involved with. Interestingly the other man they arrested has not yet been served his court subpoena as apparently he lives in the UK! Whilst we have to remain hopeful for meaningful change, unfortunately in the 16 years since I first got involved with illegal bird trapping on Cyprus it seems not a great deal has changed on the ground. However, in addition to the dedicated work being undertaken by BirdLife Cyprus I have also been fortunate to see at first hand similar work by volunteers and staff of the Committee Against Bird Slaughter (CABS) who have been actively involved since 2008 in tackling this pernicious problem. They are undertaking night time and early morning patrols to identify trapping activity that can then be passed to the Cypriot authorities and the SBA police. While I was there they made a series of four night time visits to the Cape Pyla hot spot. This is a dangerous area with trappers on patrol during the night to guard their nets, police officers have been assaulted here. Though not covering the whole area, on their four visits they recorded between 20 & 40 electronic calling devices playing birdsong during the night, pulling down migrant birds into the acacia prior to being driven into the waiting nets at first light. The concept of so many illegal devices in such regular and blatant use on a British Military base shows the clear disregard the trappers have for the authorities. While our paths didn’t cross, Chris Packham and a film crew were also out on Cyprus, recording the problem and hopefully there will be more exposure of the problems on Cyprus to come. There is little doubt this is a complex and difficult problem with major criminality involved. Like most crime it's about supply and demand. In the longer term it is to be hoped public attitudes will change and people will not be prepared to have this pointless item on their dinner plate. For hope to become more tangible, in the more immediate future bringing meaningful pressure on the restaurant trade in the Cyprus Republic and finally clearing the acacia on the ESBA would seem to be the two most pressing issues. On a personal note, and on behalf of the RSPB, I would like to thanks the efforts of Base Commander Chief Superintendent Jim Guy. Jim retires at the end of this month as the longest serving UK police officer, having passed an astonishing 50 years in 2016. Having started his career in Scotland, he moved to Cyprus in 1998 and in 2015 was awarded the Queen’s Police Medal for gallantry and distinguished service. I have spoken with Jim on many occasions since my first trip to Cyprus in 2000, his help and good humour have always been greatly appreciated whilst trying to tackle what remains a very difficult problem.